Hello dear GISH PICKS reader! School is almost out so it’s time to get serious about your kids’ summer day camps. Check out THE SUMMER BOOK® ONLINE – with over 200 camps to choose from, there’s at least one camp that’s perfect for every child! 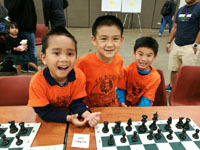 You can find camps by age group, area of town, subject matter, dates, cost, and much more! It’s so easy, you’ll love it. Best of all, you can search from anywhere – the carpool line, at work (shhh! ), and while at the beach. My guide to summer camps is the LARGEST and MOST ACCURATE guide in the city– I’ve been researching Houston day camps since 2003 and I love finding cool day camps for kids. I’m all about IGNITING LIVES (see why here) and exploring interests during the summer at camps are a great way to do that. Naturally, I love to PICK camps, just like I love to PICK cultural activities! Below is my curated list of some camps I want you to be sure you check out. I’ll be sending these out from time to time on Fridays so be sure to open your emails. Happy searching! And if you have any questions or would like a speaker to come and talk to your group about summertime family fun, please contact me. I’d love to help! The A.D. Players’ Theatre Arts Academy presents camps for all ages, all interests. 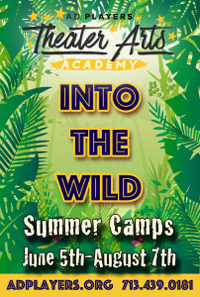 Topics include “Madagascar”, “Monsters, Inc.”, “Where the Wild Things Are”, and “The Jungle Book.” TAA is a branch of the AD Players Theater Company and offers training for artists of all ages with a primary focus on ages 5-18. They specialize in developing individual artistry and the student as a whole while training students and providing them with tools which can be utilized in theater and life experiences. In each of their 16 weeks of camp, students will make masterpieces inspired by a rich collection of artists from a new destination each week. Students will build their skills and learn new techniques in drawing, painting, sculpting, mixed media and collage. At the conclusion of the week, students will have a beautiful collection of personal masterpieces that represents all of their more fully developed creative skills and talent! Their summer programs (and all classes and programs) are for artists of all abilities, including special needs – everyone is welcome! 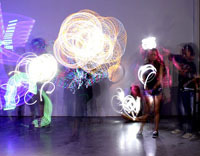 artmixstudio will be glad to create a day camp for other ages or needs with a minimum of five artists. Aurora Picture Show's popular, hands-on creative filmmaking camps give kids the opportunity to learn about, create, and discuss film and video. Local professionals guide camp participants in developing, shooting, and editing collaborative digital short films, and then these projects are premiered in a special showcase at The Museum of Fine Arts, Houston on Saturday, August 12. 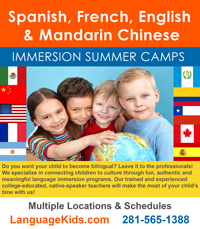 Each camp is Monday-Friday, 9am-2pm at Aurora’s workshop space at 2442 Bartlett Street. The Bridges Academy of Fine Arts will produce a one-hour "Junior" version of the hit Broadway musical “Annie” this summer in their annual Jerry Eckles Music Theater Camp. Enrollment is open for students entering grade 2 through graduating seniors, and the camp will run Monday through Friday, June 19-30 from 9am-5pm. Tuition is $250, with a 10% discount for each additional sibling you enroll. All camp activities will take place in the Rotunda Theater at St. Luke's United Methodist Church at 3471 Westheimer in central Houston. 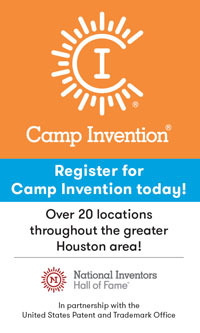 This summer, launch your child’s imagination at Camp Invention! All-new modules mean all-new fun as children invent, build, question, and discover. Children in kindergarten through 6th grade experience real-world problem solving and creative thinking as they transform the terrain and ecosystem of a distant exoplanet, take risks as future entrepreneurs, blast rockets and rubber chickens, and wire a circuit to create their own Spy Gadget Alarm Box! Local educators lead a week of hands-on activities that fuel children’s 21st century skills. Early registration discounts are available so don’t miss out on this exciting opportunity. If you love to perform for family and friends – this is the camp for you! Led by actors/directors from Missoula Children’s Theatre as well as The Grand’s camp staff, camp will consist of daily rehearsals and direction on acting, singing and technical theatre, as well as theatre crafts and performance instruction. 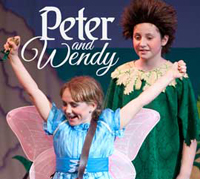 Summer Theatre Camp is a week-long residency program presented by Missoula Children’s Theatre and The Grand and will culminate in a full performance of PETER AND WENDY on Friday, July 28 at 6pm on The Grand’s stage. At Gerry and Greta’s Art Camp Adventures, every child is an artist! They’ll have lots of fun creating awesome art projects and taking a daily afternoon break in The Zone's huge Inflatable Bounce House Room. There’s a free Pizza Party on Fridays and unique art themes each week. Campers will create exciting projects as they use a variety of art materials, try new artistic styles, and learn about different artists. Small classes ensure lots of one on one time with veteran art instructors and camp directors Gerry Melot and Greta Bernitz, enabling every young artist, from beginner to advanced, to grow, learn and blossom. Project ReadWrite Creative Writing Summer Camp is a 5-day, intensely creative, highly educational writing & video production workshop designed to helps kids ages 7-14 bring their big ideas to life! Budding writers and filmmakers can sharpen their reading, writing, artistic, and directorial talents as they transform their original stories into richly illustrated moving pictures and hardbound books. This two-week workshop centers around children’s natural love of storytelling, which is the foundation for self-discovery, self-confidence, and self-regulation. 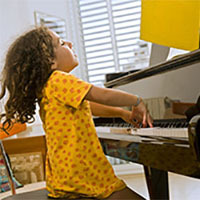 In developmentally appropriate workshops for ages 4 to 11 year-olds, psychotherapists Victoria Jones and Dr. Catherine Boswell have created a workshop to help children succeed in a world that favors perfectionism and competition. 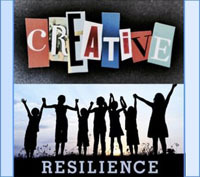 The tools for insight and growth will be storytelling, creative movement, acting, mindfulness meditation, play, drawing, painting, singing, games, puzzling, and bookmaking. The workshops are from 9am-noon Monday through Friday; early and late care are available for an additional fee. 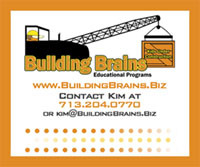 Simultaneous 90-minute Parent Workshops are also available on Wednesdays, 9-10:30am, for an additional fee. Siblings get a 10% discount.